Lately, I've been enamored of rice bowls and this one really takes the cake. 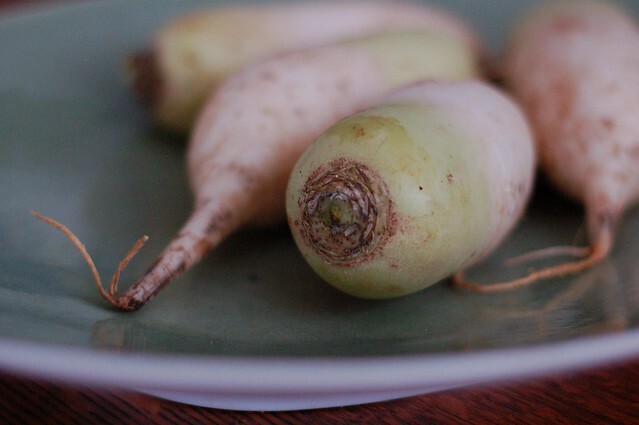 I mounded up a big spoonful of short-grain brown rice, added some of the delicious leftover tahini-ginger kale I wrote about two weeks ago, sliced a perfectly ripe avocado, peeled a hard-boiled egg and topped it with a little mound of quick pickled daikon radish and carrots I'd made. Then dusted the egg and avocado with some sea salt and sprinkled toasted sesame seeds over it all. It was so good. 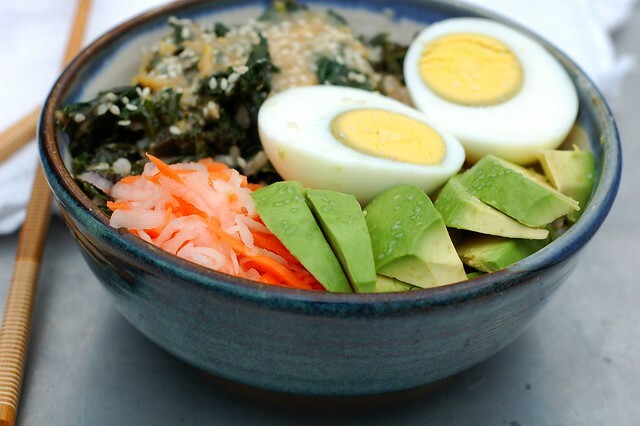 Not only was it a pleasure to eat - each bite mixing buttery avocado, spiced kale, nutty rice, hearty egg and zingy pickled daikon, I also felt perfectly full and nourished afterwards. 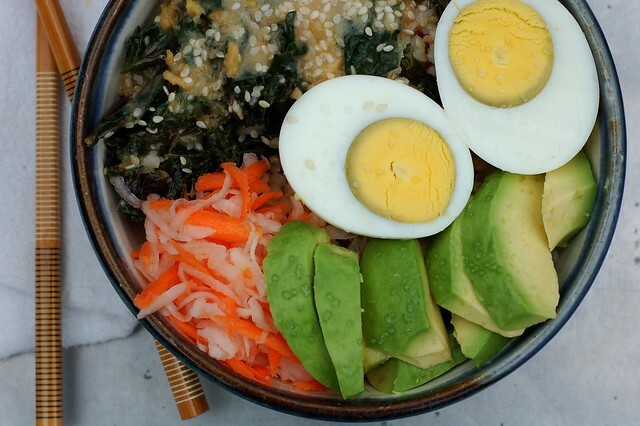 Rice bowls are one of those things that are easy to make if you've got the right components lying around - the rice, the pickled veggies, the eggs, the kale, the avocado, etc. It is a meal born of good leftovers and a little advance planning. 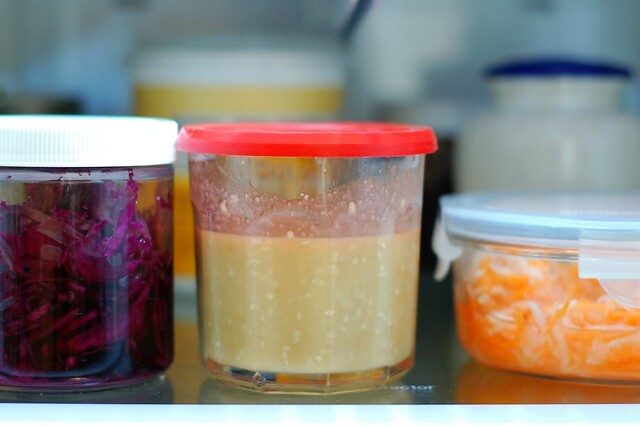 So make a batch of the tahini-ginger dressing and leave it in your fridge. That makes it really easy to make the warm kale with tahini-ginger dressing. And you can either make it fresh or just make more than you think you'll eat and save the leftovers for this purpose. The concept is so flexible and so tasty - you can use different vegetables, different dressings - whatever you have on hand. 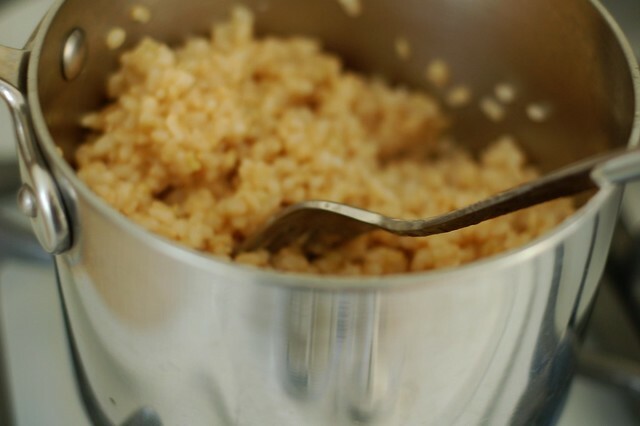 I've included links to a few other ideas that would make for a good rice bowl below this recipe. Enjoy! 1. Put the rice and kale in a ceramic bowl and microwave it for 30-45 seconds to warm it (you can also pop it in the toaster oven for a few minutes if you prefer). 2. Arrange the avocado slices, the pickled daikon and the hard-boiled egg over top of the rice, and sprinkle with a little sea salt and some sesame seeds. this looks amazing. need to prep some of the stand-bys for it to add to my rotation of quick meals! thanks for sharing.